Mobile marketing uses the latest web technology to create targeted mobile ads, responsive websites and mobile apps. 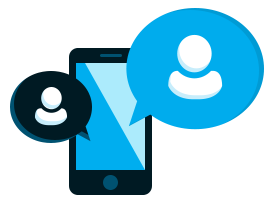 Mobile marketing services create effective two-way communication with your customers. These solutions are cost effective, naturally shared and, most importantly, easily measured. We provide mobile web design and marketing services that strengthen in-store offers with mobile-powered engagement. Our work improves mobile search, increases mobile sales and ensure the best mobile experiences. At the heart of our mobile-first approach is responsive website design and development. We’ve launched award-winning mobile-ready sites that convert visitors into customers on any device. We want to create a flexible site for your business, too. Let’s explore how mobile marketing can improve customer acquisition and engagement. We integrate data access for students. Plus we create a new website design that reflects UBC's branding guidelines. Within the first month, the new website helps 26,000+ customers access how-to videos to complete do-it-yourself projects. We build a responsive website that informs more customers originating from tablets and other handheld devices.